N.Dutta & Sons 5 Ghat/Scale,34 Keys,38 Parda 2 Set Reed Harmonium - B Quality@32500 Rs [Mrp:-32500] - Onlinedeals.discount - A leading product discovery website. Find the true prices of products, read reviews and buy top brand products at reasonable prices. B quality- Made of seasoned Burma Teak wood & combination with German 2nd quality Pine wood and German 2nd quality Steam Beach wood, Italian 2nd quality Nylon & Italian 2nd quality Celluloid on liver stick and in board also. 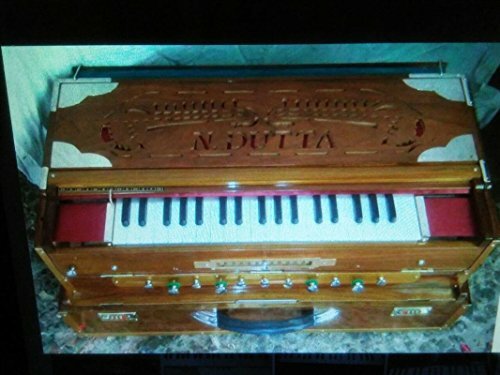 5 ghat/scale, 34 keys, 38 parda 2 set reed harmonium made of seasoned burma teak wood italian celluloid & nylon, gloss gala polish, machine gloss/machine matt finish all brass engraving decoration, palitana, samrat/jibanlal reed, italian.